"I just finished your beautiful book. I fell in love with it." Growing up in evangelicals circles in the 80's/90's that was always a 'turn or burn' message, with a heavy emphasis on Jesus being the way out of hell and into heaven. Your book reminded me that this verse is actually stating the only way to find our belovedness is in Him." "Not Who I Imagined, is changing my life!" 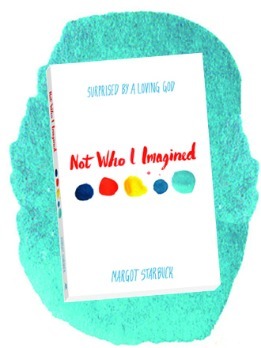 Your book, “Not Who I Imagined,” is changing my life! The face I give God is one that is rigid. I don't want it to be this way and I know it's not the true face. I know God loves me with all his might. When God's true face in my mind matches his love,that will be AWESOME! I have been longing for that undeniable, unmovable, unbelievable, undemanding, no-strings-attached, God-love. The love that says I'm perfect how I am. That I can't do anything to change that. This is what hit me so hard in your book. I am accepted as I am now. That nothing can change His love for me. This is only the start of the process, I know, but it is fantastic! I have only just tapped the surface of the ice around my heart, but it's cracked, and it feels great! So I want to thank you. Thank you for what you do. You are a wonderful writer, and God has given you a beautiful gift. Please continue to write and affect people like me. P.S. This is not just a book- it's a transformation that I need. I need to let the words soak in. I can't wait to finish and I know it will be read more than once!